Mulled wine is a term used to describe wine, usually, a red variety, infused with spices and served warm. Mulled wine is popular throughout Europe and has been served during the winter months for centuries. Depending on the country of origin, mulled wine may go by different names such as Glogg (Sweden), Vin Chaud (France), or Glühwein (Germany). The ingredients for mulled wine vary depending on the region. Common spices used in mulled wine include cinnamon, cloves, nutmeg, anise, allspice, and vanilla. The addition of fruit or sugar to sweeten the mixture also varies from recipe to recipe. Bitter orange is a common additive, but some recipes also call for apples, figs, ginger, or even raisins. The type of alcohol included in mulled wine again varies from recipe to recipe. Most recipes begin with red wine and may have one or more other liquors added. Vodka, brandy, rum, cognac, sherry, and akavit are all popular additives to mulled wine. Alcohol-free mulled “wines” can be made by replacing the wine with fruit juice or boiling the mixture until the alcohol has evaporated off. Alcohol-free versions are usually simply referred to as mulled cider or wassail. 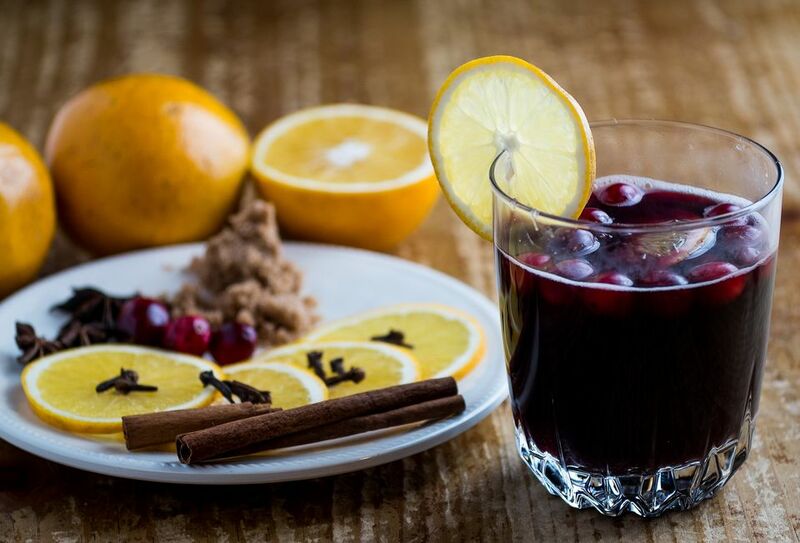 Most mulled wines are prepared by combining the wine with the spices, fruit, and other additives. This mixture is simmered to allow the flavors to infuse, after which the mulled wine is either strained and served immediately or refrigerated to allow further infusion of the flavors. Some recipes call for a full 24-hour, refrigerated infusion. The additives are then strained out and the mulled wine reheated prior to serving. Mulled wine has become a favorite tradition during the winter months because of its warming qualities. Drinking warm liquids warms the body from the inside out and alcohol acts as a vasodilator, allowing warm blood to flow more freely. The addition of warm spices, such as cinnamon and clove, add to the warmth and comfort of this drink. Mulled wine is traditionally sold by European street vendors throughout the winter months and during holiday celebrations. Mulled wine is often served with almonds, spiced cookies, or biscuits for dipping. In Norway, glogg parties, where glogg and rice pudding are served, are a common occurrence. Wassail, which can refer to either an alcoholic mulled wine or simply a spiced cider, has ceremonial significance. The act of wassailing consists of singing, drinking, and celebrating the health of the trees from which apples are harvested. Wassail is still used in reference to celebrations and drinking today, although the focus is more on wishing good tidings on one's neighbors rather than a good harvest.